B & H Engineering, P.C. 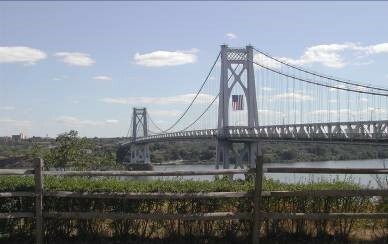 has provided construction inspection services, as a prime consultant, to the New York State Bridge Authority for the Rip Van Winkle Bridge tack weld removal, structural steel repairs and approach roadway repairs. The Bridge repair work included grind and remove tack welds, dye penetrate test, touch up paint, replacement of portal and sway frame knee braces, remove existing asphalt concrete pavement, Portland cement pavement and replace with asphalt concrete pavement; replacement of sub base; under drain and sidewalk; installation of stone slope protection; removal of 340 feet of broken storm drain and replace with 12 inch poly storm; installation of new catch basin; and work zone traffic control.